My daughter has a subscription to Animals and You magazine and the latest edition has some information on the David Sheldrick Wildlife Trust and how they try to help orphaned animals. Minxy and her love of animals, hence the animal themed subscription, had asked to sell lemonade to raise money to help the charity (too much looney tunes and ICarly maybe) which I said wasn't really possible. She then suggested a sponsored read - great idea! She loves reading so between us we thought that reading 50 books in 50 days would be the best option. 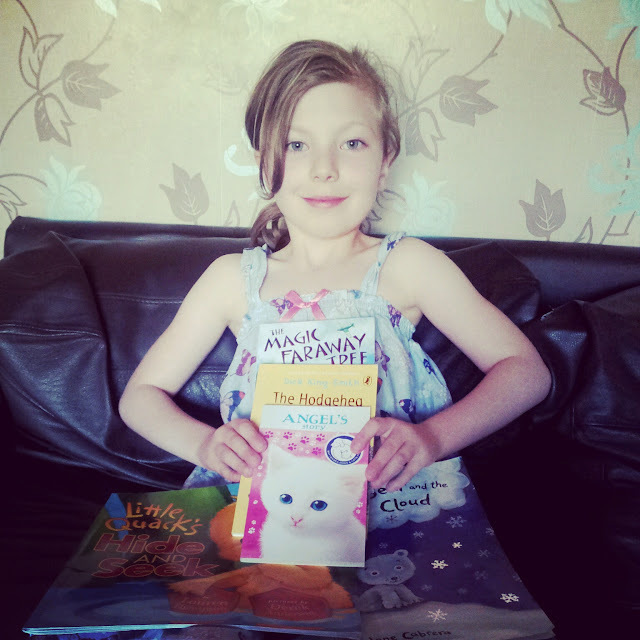 We took this picture this evening to use as her image for her just giving sponsor page ready for her readathon to begin on 1st June. If you would like to sponsor her please visit www.justgiving.com/chloesreadathon - she and I would really appreciate your support. Aw she looks very proud. Good luck with her readathon! Wow that is an impressive undertaking, looks like she is up for the challenge though! What a brilliant idea and i wish her luck with that! The Magic Faraway Tree is one of my favourite books ever! Good luck with the readathon! I loved Faraway Tree and Hodgeheg when I was younger!